SEOUL, June 28 (Yonhap) -- The defense chiefs of South Korea and the United States agreed Thursday to continuously devise measures to build confidence with North Korea as long as the communist regime maintains "goodwill dialogue." However, Defense Minister Song Young-moo and his U.S. counterpart James Mattis pressed Pyongyang to take "concrete and irreversible measures toward denuclearization," saying that without such action, international sanctions should be kept. Their 70-minute meeting in Seoul came after the allies indefinitely suspended a set of combined military exercises as a goodwill gesture to facilitate diplomacy on the North's nuclear disarmament. "Both ministers shared the view on the importance of continued and close cooperation for the denuclearization of the Korean Peninsula and the establishment of peace amid the dynamic change in the security situation of the peninsula," they said in a joint press statement. "In this regard, (the two sides) agreed to continue to strengthen communication and cooperation," it added. 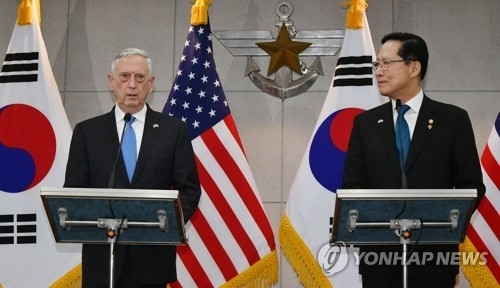 On the issue of how to proceed with future exercises in a way that does not undermine the momentum for dialogue, Song and Mattis agreed to make a joint decision on it in light of progress on the North's denuclearization, a Seoul official said. "When it comes to the combined exercises on the peninsula, the two sides agreed to make a joint announcement on them after consultations over their timing, scale and content in consideration of progress on the North's denuclearization and each unit's combat preparedness posture," the official said, declining to be named. Seoul and Washington have indefinitely suspended the Korea Marine Exercise Program and the annual Ulchi Freedom Guardian exercises, which were slated to kick off next month and in August, respectively. The suspension has sowed concerns that the allies could eventually halt all other combined exercises in a way that would attenuate their longstanding security partnership and deterrence capabilities. On the issue of transferring wartime operational control, the defense chiefs agreed to strengthen cooperation to ensure that conditions necessary for the transfer can be met "at an early date." At their Security Consultative Meeting slated for autumn in Washington, the two sides are expected to agree on a broad road map for the transfer, which observers expect to come in the early 2020s. The joint statement also pointed out that the bilateral alliance is "more solid than at any other time." "(The ministers) agreed to closely cooperate to develop the alliance in a future-oriented, mutually complementary way," it reads. During his opening remarks, Mattis reaffirmed Washington's goal of the complete, verifiable and irreversible denuclearization of the peninsula, and its will to keep the current American troop level in the South. "U.S. commitment to the Republic of Korea (ROK) remains ironclad and the U.S. will continue to use a full range of diplomatic and military capabilities to uphold this commitment. This includes maintaining the current U.S. force levels on the Korean Peninsula," Mattis said. The ROK is South Korea's official name. "As always in close consultation with our Republic of Korea and other partners, our diplomats continue their work to achieve the complete, verifiable and irreversible denuclearization of the Korean Peninsula," he added. Mattis' remarks came amid speculation that the emerging peace mood, coupled with U.S. President Donald Trump's apparent transactional approach to statecraft, could lead to a drawdown -- or even the pullout -- of the 28,500 U.S. troops in South Korea. Trump's failure to codify the U.S. demand for the CVID in his June 12 summit agreement with North Korean leader Kim Jong-un also stoked worries about a possible retreat from it. Mattis also touched on the allies' recent decision to suspend a major combined exercise, casting it as an effort to facilitate diplomacy on North Korea's denuclearization. "The recent decision to suspend the Freedom Guardian exercise creates an increased opportunity for our diplomats to negotiate, increasing the prospects for a peaceful solution on the Korean Peninsula," he said. "At the same time, the U.S. and ROK forces remain united, vigilant and ready to defend against any challenge." Song called his talks with Mattis "timely," saying the allies stand at a "crucial turning point that may put behind a dark history of confrontation and lead to a new history of peace and cooperation." "The South and the U.S. will do their best to ensure that this precious opportunity will definitely lead to peace and stability not only on the peninsula but also in Northeast Asia and the world," Song said. Song also said that amid the changing security environment, the alliance will "grow ever stronger, more mature and mutually complementary." "In the midst of this, the U.S. Forces Korea as a symbol of the South Korea-U.S. alliance will always be with the Republic of Korea military," he added.